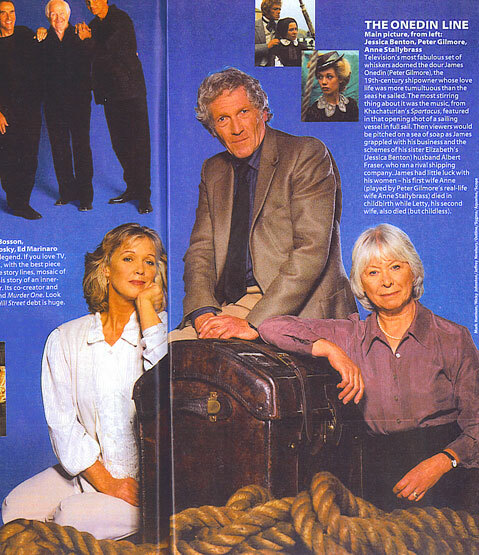 In November 1996, to celebrate BBC TV's sixtieth birthday, the Radio Times included a large feature on popular programmes from the previous sixty years, one of which was The Onedin Line. Anne and Jessica Benton, who played James’ sister Elizabeth, became best friends during recording of the series and Anne is godmother to Jessica’s daughter, Ella. The Gilmores are still close to Jessica and her family. Television's most fabulous set of whiskers adorned the dour James Onedin (Peter Gilmore), the 19th-century shipowner whose love life was more tumultuous than the seas he sailed. The most stirring thing about it was the music, from Khachaturian's Spartacus, featured in that opening shot of a sailing vessel in full sail. Then viewers would be pitched on a sea of soap and as James grappled with his business and the schemes of his sister Elizabeth's (Jessica Benton) husband Albert Fraser, who ran a rival shipping company. James had little luck with women - his first wife Anne (played by Peter Gilmore's real-life wife Anne Stallybrass) died in childbirth while Letty, his second wife, also died (but childless).